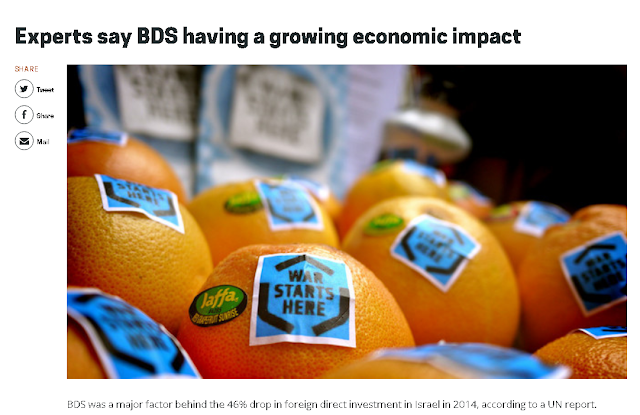 "BDS was a major factor behind the 46% drop in foreign direct investment in Israel in 2014, according to a UN report," the BDS webpage still says. YNet reported, "The report contains one very glum statistic; in 2014 $6.4 billion were invested in Israel, whereas in 2013 $11.8 billion were invested - a decline of about 46%." It turns out the UN report didn't blame BDS for the drop, but one of the Israeli economists who wrote the UN report said it might be because of a combination of BDS and the 2014 Gaza war -and admitted that her theory was only conjecture. But that guess was enough to excite the Israel-haters. Mondoweiss was over the moon, quoting Bisan Mitri, Palestinian BDS National Committee secretariat member, who said, "Ten years after its launch, the BDS movement is being recognised by one of the authors of a UN report as starting to have major impacts on the Israeli economy. Israel’s shift to the far-right, its intentional crimes against Palestinians and the BDS movement and rapid changes in public opinion following Israel’s massacre of Palestinians in Gaza last summer mean that Israel is increasingly becoming a less attractive investment destination." BDS was claiming this victory across the board, with no caveats. They knew that they were having a major effect on Israel's economy. They raised money based on this victory. So how has direct foreign investment in Israel done since then? It has more than tripled! The 2018 report shows that Israel's FDI inflows has soared from $6 billion to nearly $19 billion in only three years! 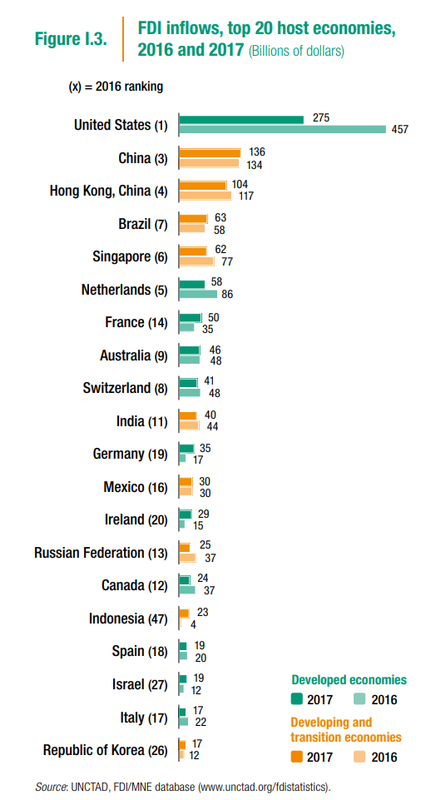 Yes, the statistic that was giving Israel-haters virtual orgasms in 2015 as proof that Israel's fortunes are finally on a downturn is now seen, three years later, to have been an anomaly - and Israel has not only tripled its FDI inflows, but it was ranked #18 in the world in 2017 (up from #27 in 2016), far higher than even the UK! 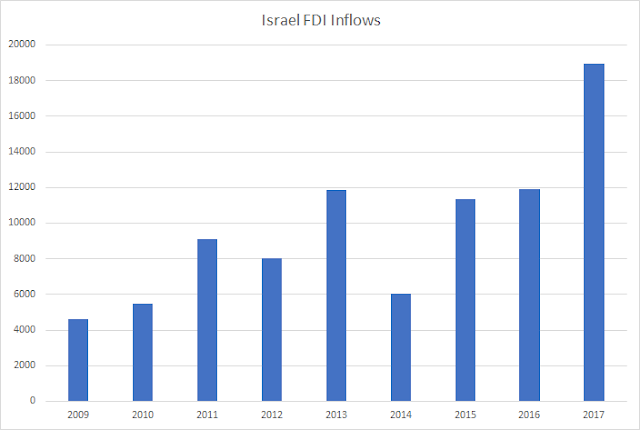 Israel's 2017 increase of 59% is even more astonishing considering that the total FDI inflows to developed countries decreased by one third in 2017, from $1.1 trillion to $720 million. In the end, the very nature of foreign investment is based on some very large deals, and it is going to vary a lot from year to year. If BDS is going to take credit for Israel's dip in FDI in 2014, then it must take responsibility for Israel's huge FDI increase in 2017. Which means that if BDS was a corporation, its CEO should resign in disgrace for how poor it meets its stated goals.